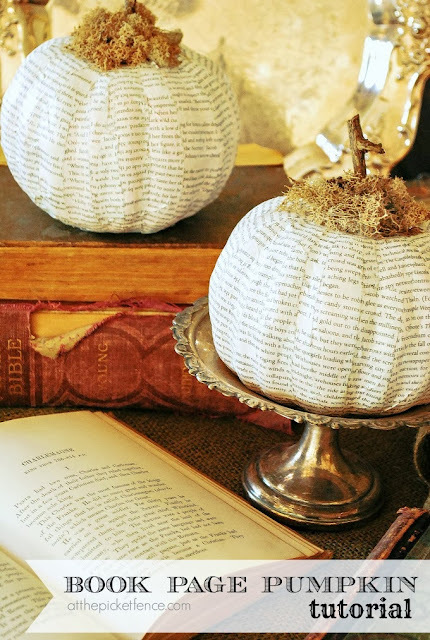 There are a lot of downsides to carving a pumpkin: the guts get everywhere, your arms are sticky for the rest of the day, and the gourds begin to rot as soon as you've created your masterpiece. It's one of the reasons why I haven't bothered doing a jack-o'-lantern in the last few years. 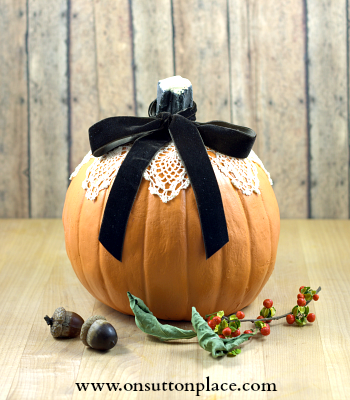 Then I saw this sweet lace and velvet pumpkin from On Sutton Place on Pinterest the other day and I felt that itch to get crafty once again. In case you're looking for a few ideas of your own, I've rounded up my favorite new ideas floating around the web. Most take only a matter of minutes to put together and all look amazing. Just click on the links for the instructions. Here's what I liked best. Mom 4 Real hot glued orange buttons in a variety of sizes to a craft pumpkin and topped it off with a bow. How adorable is that? 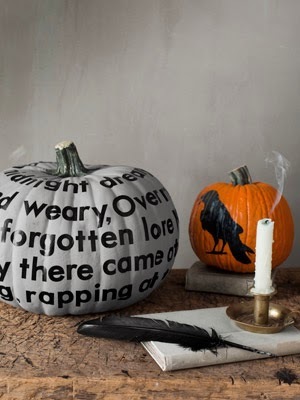 Country Living used text from an Edgar Allan Poe wall decal to decorate their Raven pumpkin. The site painted the pumpkin first, but I think you could get the same look without the mess using a blue-grey pumpkin. You can also skip cutting up the wall decal by buying letter stickers from a craft store. Bibliophiles will love these gourds covered in book pages and moss from At The Picket Fence. 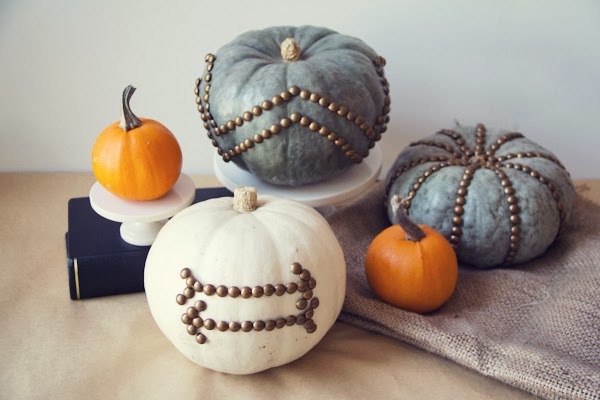 Lovely Indeed used furniture nails to make simple patterns on blue and white pumpkins. The one with the studded grooves is definitely my favorite of the bunch (or should that be patch?). 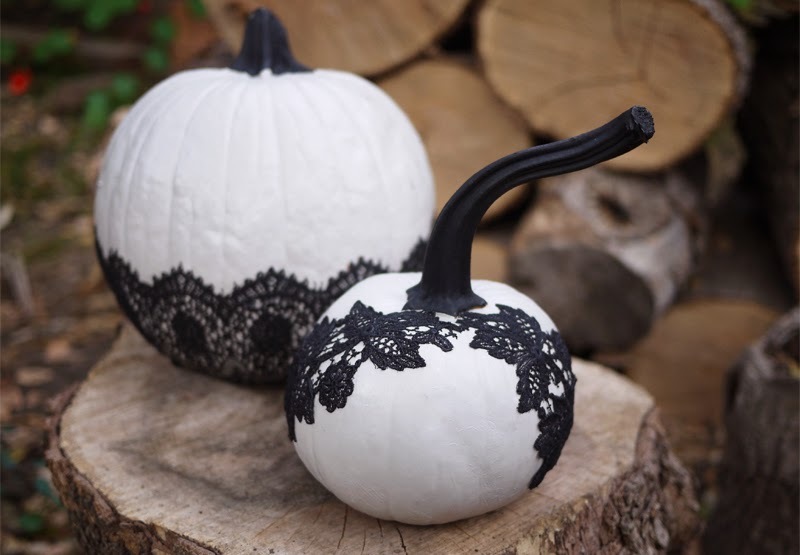 Erica from HonestlyWTF used white and black paint before applying lace to the pumpkins, but you can skip that step by using a white pumpkin as your base. 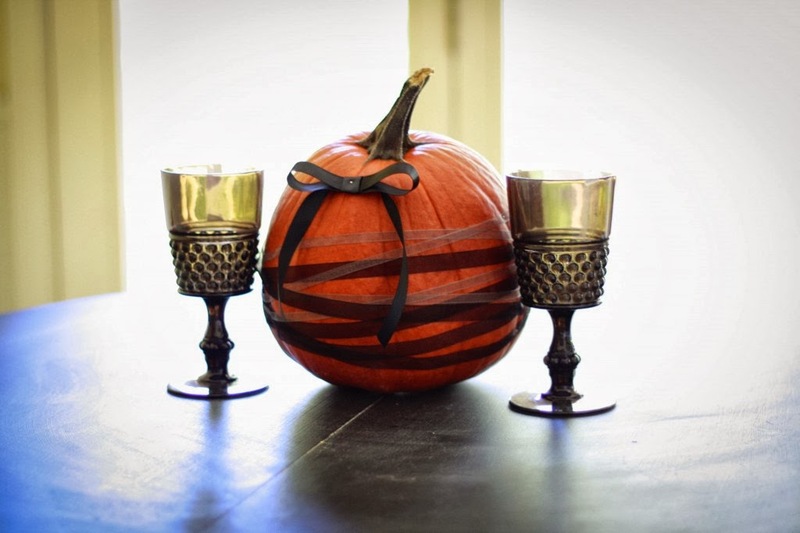 For those of you who think less is more, Craft Pond did an excellent job decorating this understated pumpkin with a few strips of gauzy ribbon. And on the opposite end of the spectrum, Magical Christmas Wreathes used studs and spikes to punk up their pumpkins. I saved the easiest for last! 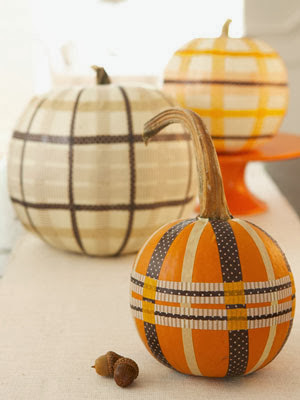 Forest & Field used washi tape to create plaid patterns on these little pumpkins.